The export log market rebounded much more strongly than expected in November on the back of rapidly reducing log inventory in China and concerns about log shortages. Total log inventory at Chinese ports has dropped to 2.6 million m3 as reported for the first week in November. Export log prices rose $8-$18/JAS m3 depending on grade and port. Our recent trip to China uncovered innovative ways this market is making use of our Radiata pine, diversifying demand away from the past high reliance on the apartment construction market. 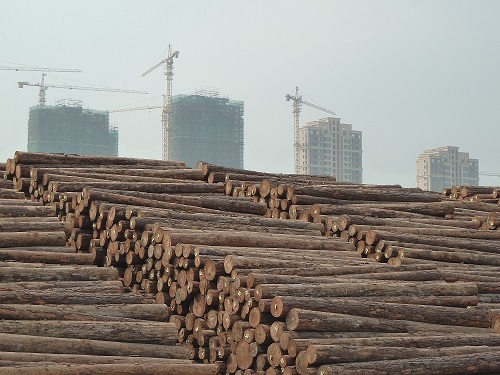 Log inventory in China is expected to continue to drop, to perhaps as low as 2 million m3. Indian, Korean and Japanese log demand is also steady to strong. Rapid increases in CFR price has meant a wider-than-usual range of pricing across the various export log purchasers operating around New Zealand. Intense competition for logs at ports such as Wellington has seen log prices there at parity with the bigger ports like Tauranga and Marsden Point (Wellington prices are usually at a discount to the bigger ports). Some domestic log processors are feeling squeezed and struggling to secure adequate log supply as harvesting levels declined through the winter and now export prices are rebounding quickly. Demand for housing-related timber and wood products is strong, but so is supply and many wood products' pricing is "sticky" - hence the squeeze. Activity in the residential dwelling construction market in Christchurch is declining whilst the construction of commercial buildings is rising. This tends to reduce demand for wood products in favour of concrete and steel products. PF Olsen staff were on a log market intelligence trip in China late October/early November. The following section includes observations and insights gained from the trip. The housing market in China is clearly subdued. Tall cranes stood like sentries over countless grey concrete towers of partially constructed apartment blocks - some of the cranes were swinging and lifting, but many appeared idle. Then there are the numerous completed apartment towers with large Chinese writing across the facades and the telephone number to call if you want your dream home - and maybe a bargain at the moment. But that's old news since the housing downturn in China commenced over a year ago. From logs to apartments (photo above). Whilst little Radiata pine is used on constructing these concrete buildings, so many have been built over the past five or so years that demand for Radiata pine has surged. Future demand, however, will be subdued for some time as excess housing stock is cleared. What become apparent as our trip progressed, however, was that Chinese wood processors were finding new markets, and innovative ways of processing Radiata pine into the new products. A leading integrated wood processor in the Shandong region (the Lichen Group) was producing little lumber for construction since the price was described as "terrible". It was, however, flat out producing a whole range of other products for which there was strong demand. For example, we were told Lichen could double its supply of Radiata pine doors being exported to the USA from current levels. The limitations to doing this were log supply and (surprisingly) labour. This is related to the high level of wage inflation in China as the population urbanises. 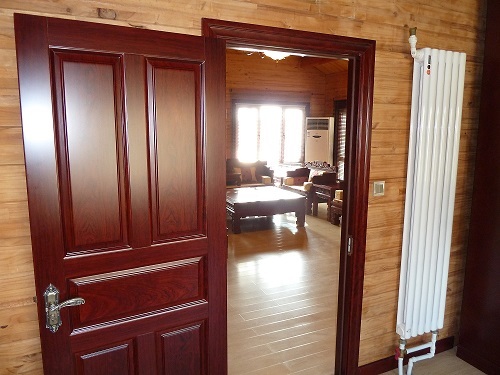 Demand for Radiata pine doors from China to the USA exceeds supply. 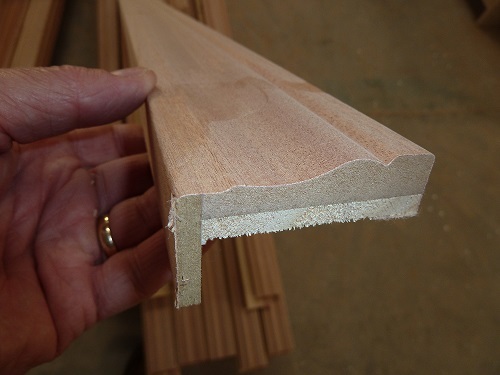 This composite moulding (photo above) comprises finger-jointed Radiata pine, MDF and a paper-thin decorative hardwood veneer. Whilst is doesn't look like much Radiata pine is being used here, think of the millions of lineal metres of the product that could be consumed in China and globally. The important implication of the above trend of new markets and products is that it provides an alternative (and potentially strong) market for unpruned, utility logs (the A and K grades). If the trend grows, then Radiata may successfully diversify away from the current over-reliance on the Chinese apartment construction market, and instead be exposed to a larger range of markets and end uses (both domestically in China and markets to which China exports). This also bodes well for the long term when mass urbanisation ceases in China. The strong price of pruned Radiata pine logs in China is also a manifestation of the high demand for furniture, clear boards and panels, and the reduced supply of South Sea and illegally sourced hardwoods. 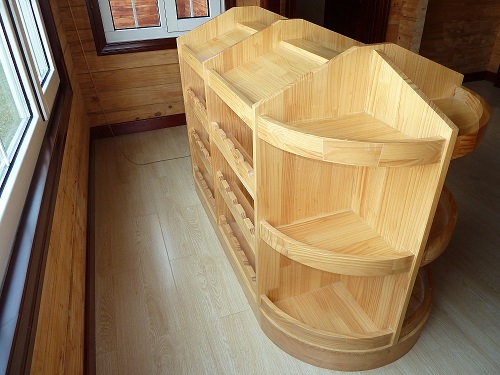 A Radiata pine wine storage unit made from finger-jointed edge-glued wood. These new markets and end uses also raise some new changes around wood quality. 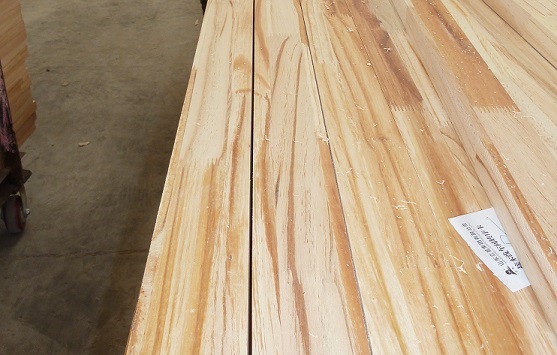 Whilst it doesn't matter if A-grade logs are sap-stained when they are cut into construction lumber, it does matter if they are manufactured into appearance grade products. If sap-stained, these products then have to be stained or coated and are less valuable. As a consequence of more focus on appearance grade products resin has become new issue for Chinese wood processors of upruned logs. This is not just resin pockets (an identified issue in pruned logs in the NZ wood industry) but also high resin content generally in unpruned logs which again prohibits their use visually; even coatings can be affected as the resin tends to seep through them. Heavy resin, or oil as the Chinese call it, degrades appearance products made from unpruned Radiata pine logs (photo above). In construction end-uses resin is not an issue. This may, however, require a re-think on how we source and grade unpruned logs destined for this use. 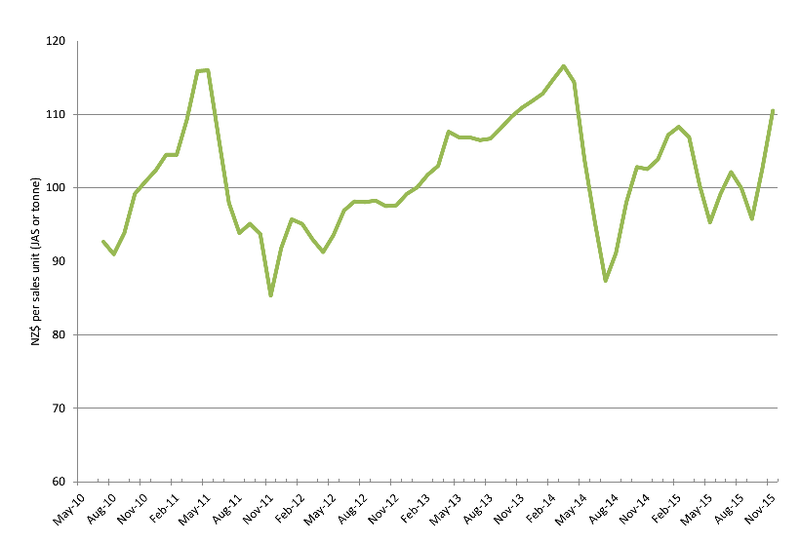 The PF Olsen log price index rose eight points from $103 last month to $111 this month. It is now $26 higher than its cyclical low of $85 in November 2011 and $8 above the two-year average and $9 above the five-year average. Pruned prices [export pruned logs at some ports] are reaching prices not seen since 2001 when domestic pruned logs exceeded $200/tonne. As reported last month, domestic structural log prices are also relatively strong. Basis of Index: This Index is based on prices in the table below weighted in proportions that represent a broad average of log grades produced from a typical pruned forest with an approximate mix of 40% domestic and 60% export supply. Note: Actual prices will vary according to regional supply/demand balances, varying cost structures and grade variation. These prices should be used as a guide only. With continued drops in log inventory in China and relatively strong demand from Korea, India and Japan, CFR prices are expected to continue to firm and flow through to NZ at-wharf-gate prices. The strengthening of the NZ$ against the US$ in the second half of October lost momentum and the cross rate has been falling so far through November. If this continues, it will further support higher NZ$ at-wharf-gate log prices in December. CFR prices have moved up to about the four-year average and are probably not yet high enough to stimulate significant supply from other sources (e.g. Russia and North America). Demand from China is expected to continue to be reasonably strong as Chinese wood processors divert attention away from the weaker construction lumber market to the more buoyant furniture, door, appearance and remanufacturing market segments. These are supported by the resurgent USA housing market and renovation and refurbishment in China and Korea. The domestic log market is expected to remain strong with domestic processors vying to secure log supply to keep their order's fulfilled.